Our Focus is Your Eyes. This is a 34 year old nurse who was worn out from her friends and patients always asking if she was tired. The post op photo is 4 months after an upper lid blepharoplasty and trans-conjuctival lower lid blepharoplasty. She is loving her refreshed, natural look. This is a 44 year old man before and 3 months after an upper and lower eyelid blepharoplasty. He was thrilled with his new eyelids. There was enough of a change that he felt more confident about his appearance, but the results were subtle enough that he looks completely natural. From the minute you walk into Dr. Lattman’s office you just know you’re going to be very well taken care of. Dr. Lattman puts you right at ease and spends the time to discuss what is right for you. You don’t feel rushed and she is very honest. She is not a doctor who is going to tell you to do something that she doesn’t feel is in your best interest. The results are incredible and you will leave happy. "Dr. Lattman is caring and knowledgeable, with an artistic touch that rejuvenates in a totally natural way. Her office runs smoothly and efficiently. Fabulous in every way!" "Dr. Lattman is is a gifted and down to earth, highly skilled surgeon. Her warm and gentle approach is much appreciated. Whether it's surgical or injectables she determines that you need, you are in the best of hands! She takes her time with you and answers all your questions thouroughly. I also loved the office and all the friendly people who work there. I highly recommend her." 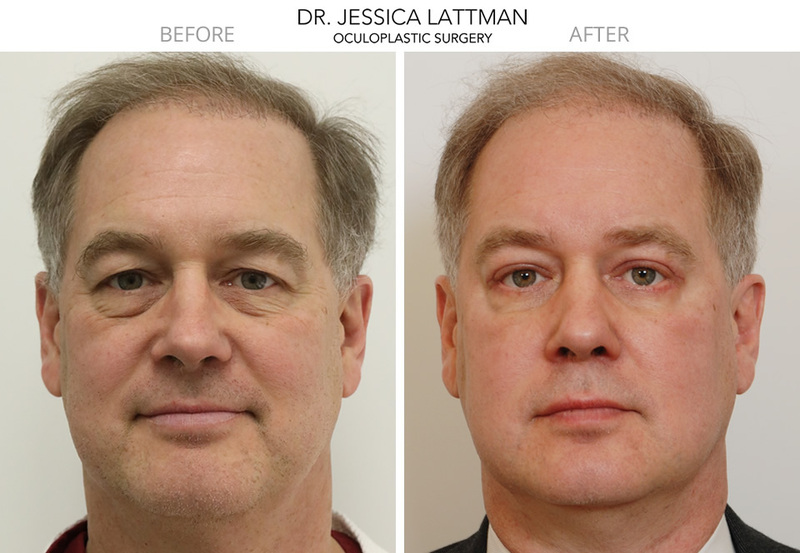 "Dr. Jessica Lattman is a professional doctor who has me look terrific. She is confident, reassuring and everyone I met in her office was outstanding. I highly recommend Dr. Jessica Lattman"
When the eyelid skin gets loose and falls, patients often feel a disconnect between the way they look and how they feel. 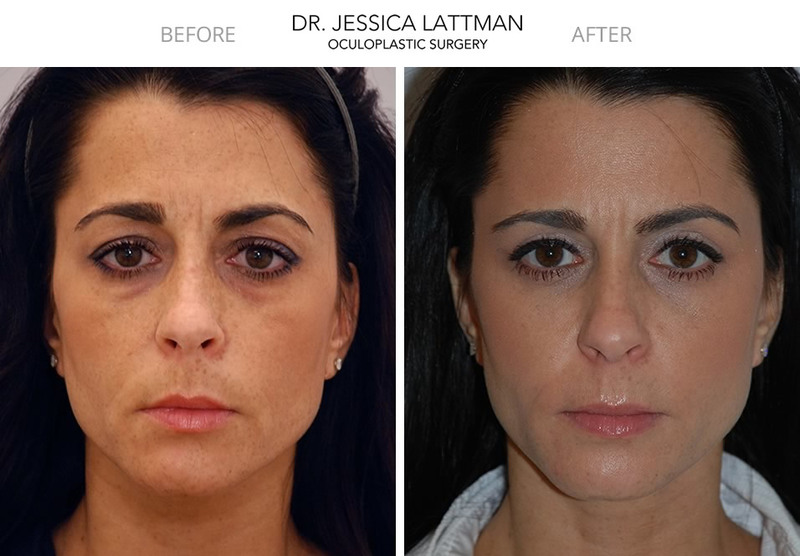 Dr. Lattman’s expertise and specialty training as an oculoplastic surgeon, allows her to provides long lasting and natural surgical results for her patients. The eyelids often are the first area of the face to show signs of aging. Over time, the upper eyelids develop excess hanging skin which causes the lids to drop and the eyelids to be obscured. Under eye bags develop when the fat pads under the eyes bulge and expand, making the lids look puffy and tired. Laxity of the lower eyelid skin and underlying muscle also causes bags and lower eyelid hollows to develop. The eyebrows also play an important role in the aging of the upper eyelids. Low brows contribute to eyelid “hooding” especially on the outer corners of the eyelids. Dr. Lattman has specific expertise as an oculoplastic surgeon to treat aging changes of the eyelids and brows. With over 21 years of experience, Dr. Lattman has a depth of knowledge of the eyelid anatomy and is skilled at the most up to date surgical techniques. As one of the most respected blepharoplasty surgeons in the country, you can be confident trusting Dr. Lattman with your cosmetic eyelid surgery, she is a true Blepharoplasty expert. 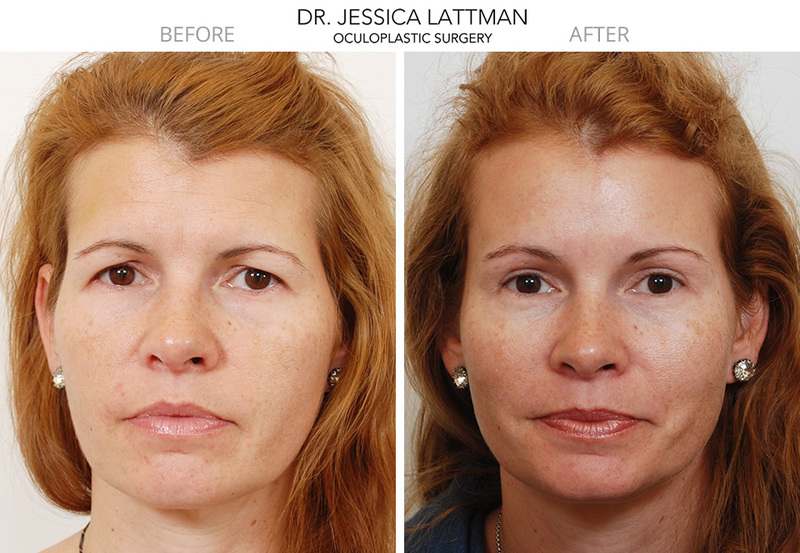 Cosmetic upper lid blepharoplasty is the most common procedure that Dr. Lattman performs. During an upper lid blepharoplasty, an incision is made across the upper eyelid and the excess skin is removed. Fat is strategically sculpted or repositioned to improve the contour of the upper eyelid. The incision is placed in the natural crease of the upper eyelid, so that it is hidden from view. As a trained oculoplastic surgeon, Dr. Lattman is able to evaluate other issues that may be associated with your upper eyelid aging changes. Ptosis, is a common condition where the upper eyelid falls and obscures the pupil. This can contribute to a tired look. In your consultation Dr. Lattman will evaluate your eyelids for ptosis and make recommendations as needed. Upper eyelid blepharoplasty can be performed simply with local anesthesia in the office. For patients that desire to have sedation, the surgery is done in Dr. Lattman’s private surgical center, with an anesthesiologist. Patients go home after surgery and resume most activities the next day. The goal of lower eyelid blepharoplasty is to restore a youthful contour to the lower eyelids. When eyelid bags develop, patients often complain of looking tired even after a good night’s rest. No matter what they do, they can’t get rid of the bags and tired look to the eyes. Dr. Lattman takes great care to individually tailor her approach for patients seeking natural-looking lower eyelid rejuvenation. Since each person’s eyelids are unique, Dr. Lattman will use one of several different approaches for lower eyelid surgery, based on your own needs. For the lower-lid blepharoplasty, she will use either a trans-conjuctival or a subcillary approach. The first provides safe and easy access to the bags to be removed, without a skin incision. This is usually indicated for younger patients with small eyelid bags. The subcillary approach is used when there is excess skin and muscle that needs to be tightened and supported. 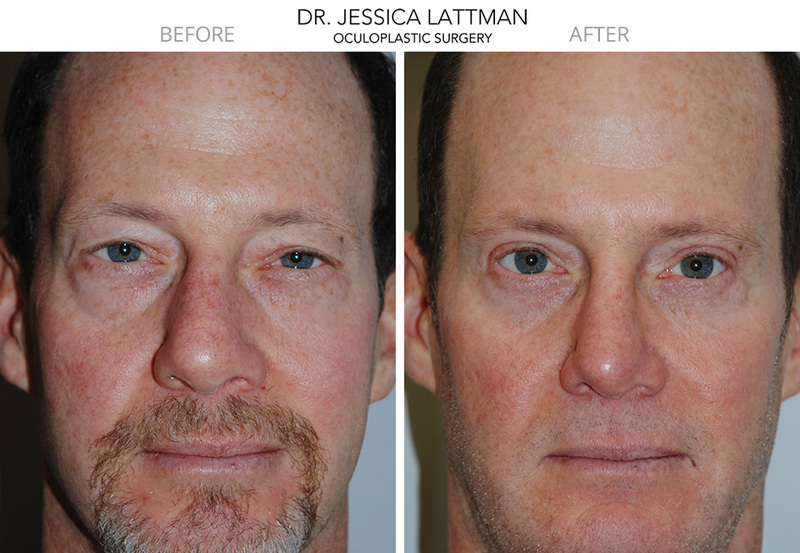 Dr. Lattman has developed and published scientific articles describing an innovative technique that allows her to tighten the deeper structures in the eyelids. This is known as an orbicularis muscle flap and suspension. Often, the lower eyelid muscle called the orbicularis oculi loosens and falls, further accentuating the appearance of bags and hollows. In these cases neither traditional transcutaneous or transconjunctival blepharoplasty can achieve optimal rejuvenation. Instead, a subcilliary blepharoplasty, combined with an orbicularis muscle suspension provides a more complete correction. Re-supporting the muscle helps to better define the cheeks, restore the natural shape of the lids, and reduces the tired appearance of the eyes. Read More about this procedure here and here. During your consultation, Dr. Lattman will evaluate the contours and individual characteristics of your entire face so that your eyelid rejuvenation blends perfectly with the rest of your face. She will also evaluate the position of your eyebrows, as the descent of the brows often crowds the upper lids, thus reducing the distance from the eyebrow to the eyelashes. Dr. Lattman will also evaluate your skin and make suggestions for addressing wrinkles and contour issues, if necessary. A typical blepharoplasty is usually takes about an hour and you will go home the same day. All forms of blepharoplasty may also be combined with an endoscopic brow lift, ptosis repair, laser skin resurfacing and injectable fillers for best results. Consult with Dr. Lattman to see what type of blepharoplasty is right for you. Please reach out to Sophia, our Patient Coordinator, with your photos and questions, via email at sophia@nyplasticmd.com, by phone at 212-832-5456 or request a consultation. Consult with Dr. Lattman to see what type of blepharoplasty is right for you. Please reach out to Sophia, our Patient Coordinator, with your photos and questions, by phone at 212-832-5456 or request a consultation by clicking the button below.